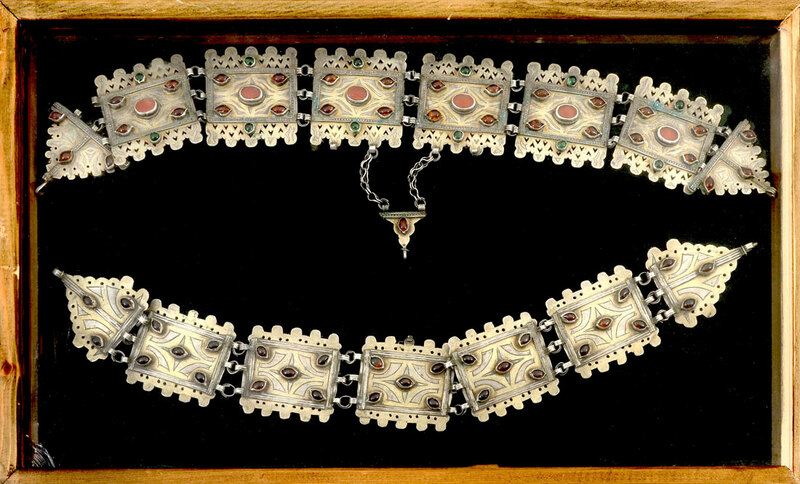 SILVER TURKOMAN BELT: Beautifully detailed Turkoman belt set with red, yellow and green stones. 5 squarish links measure approx 2.25'' x 2.25'' and are each set with 5 yellow-brown stones. This section of the belt ends with a triangle shaped link at each end, each set with 3 yellow-brown stones. The 2nd (probably front) section of the belt has 6 squarish links that are more elaborately decorated with 7 stones each ending with a triangle shaped link at each end topped with 3 stones. The belt is framed in a 11.5'' x 18.5 wooden box.